Chad Savage was Gothic.net’s lead art director/web designer for a couple of years in the late 90’s/early 2000’s. Chad Savage was also a dark artist from the moment his pudgy little hands were able to set crayon to paper. He was the kid that loved Halloween better than Christmas, rooted for Godzilla and Dracula, and really worried his Southern Baptist parents. It was very clear early on that Chad wanted to celebrate Halloween 365 days a year. With a degree in illustration and graphic design, 20 years’ experience drawing and designing for the horror genre and over 10 years’ experience in web design, Chad got his wish. Halloween, for him, is every day. His company Sinister Visions inc. is thriving, providing web design, print design, illustration, sound design, font design and more for the horror, Halloween and haunted attraction industries. Sinister Visions currently hosts/manages close to 200 dark websites; odds are you’ve already been to at least 10 of them. Chad’s artwork has appeared in (and on the cover of) numerous books and magazines and garnered awards from same. His original fonts have appeared on books, magazines, DVDs, CDs and in movies. 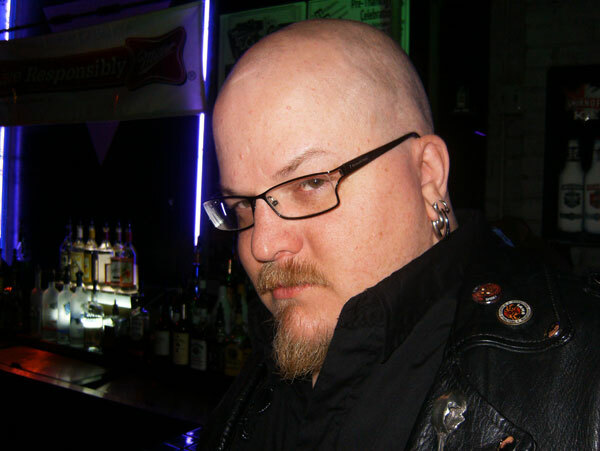 Besides running genre sites like DarkChicago.com and ZombiePinups.com, he is the Art Director and Lead Designer for annual horror conventions like Flashback Weekend, HAuNTcon, and the World Horror Convention (2006), and proudly sponsors numerous dark genre events and projects. Chad instituted and runs the annual HorrorFind Weekend Horror Art Show; he was also the Art Show Director for Convergence 10 in Chicago in 2004, the World Horror Convention in New York in 2005, co-chairman and Art Director for the World Horror Convention 2006 in San Francisco and the Flashback Weekend Horror & Dark Art Show in 2006. Chad currently lives and works outside of Chicago (OK, in Indiana) with his fabulous (and tolerant) wife Alex, lovely daughters and their fairy dogmothers Bishop & Pumpkin. You can find all Gothic.net articles and fiction relating to Chad Savage at tag Chad Savage.